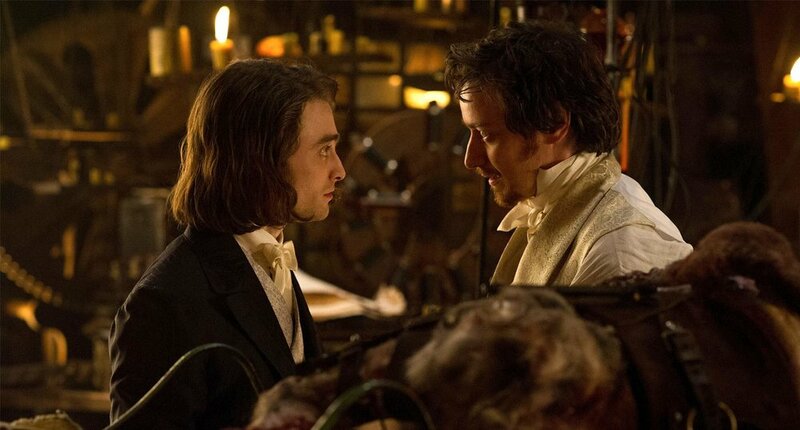 Victor Frankenstein frames itself as a retelling of the most famous monster tale through the eyes of Igor (Daniel Radcliffe), assistant to the eccentric medical student Victor Frankenstein (James McAvoy). Shifting attention away from the monster and onto the scientist duo, the film effectively drains the Frankenstein story of its horror and most of its power. What remains is a poor assemblage: part decent buddy-mad scientist comedy, overdone tragedy, middling period thriller, and boring monster movie without much of a monster. Many of the problems with Victor Frankenstein invite comparison to those I see in two recent incarnations of Sherlock Holmes—the BBC series Sherlock, starring Benedict Cumberbatch and Martin Freeman and created by Mark Gatiss and Steven Moffat, and the Guy Ritchie film franchise starring Robert Downey Jr. and Jude Law. Like these new takes on Sherlock Holmes, Victor Frankenstein is a bald-faced attempt to inject new appeal and 21st-century sensibilities into a 19th-century literary property that’s gone stale with frequent use. In the case of both updates of Sherlock, the innovations have been largely effective in attracting new audiences, even if I deem many of them questionable. In the case of Victor Frankenstein, the innovations weren’t enough to secure the film popular success, and, more importantly, many of them seem to miss the point of the tale entirely. The comparison runs even deeper, however, as director Paul McGuigan also directed several episodes of Sherlock (e.g. “The Hounds of Baskerville”). Like Guy Ritchie of the film Sherlock, McGuigan displays a fairly irreverent, and at times dismissive, approach to his source material, and, also like Ritchie, McGuigan has a tendency to over-direct and over-edit. Like both new versions of Sherlock Holmes, Victor Frankenstein is constructed with a firm belief that audiences cannot handle watching characters have conversations for any length of time without splashy camerawork and editing, flashbacks and recreations, and other visual tricks to distract and placate them. What’s worse is the plainly thrown-in action and fights. In Victor Frankenstein, the hunchbacked Igor is originally an enslaved clown in the London circus. When the doctor witnesses the hunchback amazingly reset a fallen trapeze artist’s broken collarbone, he decides Igor is just the partner he needs to complete his monstrous creation. Their escape from the circus is jazzed up with slow-mo flames and the doctor’s uncanny ability to run off the side of a train carriage martial-arts style and smack a circus member trying to stop him with his walking stick. Another ineffective alteration is the change in setting. Switching from Germany, Switzerland, and the far North (in Mary Shelley’s book) to England and then Scotland could have worked, but instead we are offered a lazy, unhistorical image of Victorian London. The costumes appear to be a negligent mix of Victorian suits and earlier Regency cravats and tight pants. What is more, the change in setting contributes to the film’s overall loss of Gothic atmosphere. An overwrought castle on the coast of Scotland with a thunderstorm and lightning late in the film is too cartoonish to generate any subtleties of mood and atmosphere. Now admittedly, most of what I’ve written thus far might be cast aside as the nitpicks of a literary-minded film critic. There is some good to the film, which I want to acknowledge, before I come to what’s truly damning. I cannot deny that the buddy-mad scientist storyline, which dominates the first half of the film, has some appeal. But it’s also another example of the filmmakers noting what worked in both Sherlock updates (Sherlock and Watson have such chemistry in both versions) and deciding to create their own dynamic duo with Frankenstein and his attendant Igor. (It’s worth noting that there is no Igor or assistant character in the book, but that the hunchback assistant is a stock character in many Gothic/horror films.) In Victor Frankenstein, Frankenstein cures Igor of his hunchback affliction fairly early on. Radcliffe’s Igor, with his wonky block of hair and earnest smile, is endearing in a dorky way, and McAvoy is clearly having a lot of fun as Frankenstein, spitting fountains as he chews the scenery as a mad scientist. The two actors generate some chemistry and the screen-time in which we see them feverishly (and drunkenly at one point) planning and creating their monsters is pretty fun. I also appreciate the presence of solid British supporting actors, even if their parts are too obvious in conceit, such as Charles Dance (Tywin Lannister on Game of Thrones) as Frankenstein’s unapproving father, and Andrew Scott (the BBC Sherlock’s Moriarty) as an awkwardly-conceived, deeply-Christian constable (he doesn’t like “Satanic” science, you see). When the buddy movie turns to tragedy with a revelation about Frankenstein’s motivations (a loss in the family) the film’s narrative and the relationship constructed between the two characters aren’t enough to carry the weight of the scene. As well, a romance plot between Igor and the lovely trapeze artist Lorelei (Jessica Brown Findlay), whom he saved early in the film, seems unnecessary. Here’s the main problem with the film though: as far as Halloween Horror, you’d best look elsewhere. Even Branagh’s overwrought Gothic extravaganza version of Frankenstein offers more along the lines of traditional movie scares. I was genuinely surprised about the near-dearth of horror in the film. We get some humorous mild gore as they assemble an early version of the monster out of different fleshy masses and organs. We get one mediocre scene chasing a Frankenstein-ape in a darkened medical college, but it does not achieve much fright. And the final climax depicting the creation of the monster descends into a shoddy rendition of a B-movie monster act. The Frankenstein monster looks like an Uruk-hai crossed with the Universal-movie flat-headed one. Victor Frankenstein delivers what no one was asking for—a strange, somewhat amusing buddy movie about Igor and Dr. Frankenstein—and forgets what everyone turning to this movie expects and will leave wanting: Frankenstein’s monster. Directed by Paul McGuigan; screenplay by Max Landis, based on the novel by Mary Shelley; starring Daniel Radcliffe, James McAvoy, Jessica Brown Findlay, Andrew Scott, Freddie Fox, and Charles Dance.